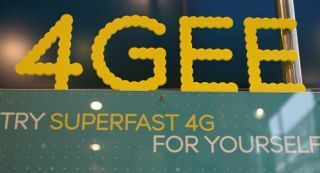 EE 4G speeds to double for 10 cities this summer | What Hi-Fi? EE is set to double the speed of its 4GEE network in 10 cities this summer, delivering peak 4G speeds of 80Mbps. Birmingham, Bristol, Cardiff, Edinburgh, Glasgow, Leeds, Liverpool, London, Manchester and Sheffield are the 10 cities set to get the 4G LTE speed increase. EE claims the average 4G speed for customers in these cities will double to around 20Mbps. Already being trialled in Cardiff, the faster 4G speeds will be instantly available to all EE customers in the listed areas for no extra charge and on all 4G phones, tablets and dongles. Network traffic is set to increase by 750% in the next three years, according to EE, with HD video streaming, sharing and downloading cited as one of the big growth areas for data usage. EE is doubling the amount of 1800MHz spectrum bandwidth dedicated to its 4GEE network, from 10MHz to 20MHz. EE is aiming for one million 4G customers by the end of 2013, promising updates on this target in the near future. The 4GEE network recently hit 50% coverage in the UK, as it expanded to new towns and cities.